This Winter has already seen a range of pyrotechnical goings on at the Avalon Marshes Centre, from charcoal burning to bronze casting, this latest excursion was into the world of ceramics. 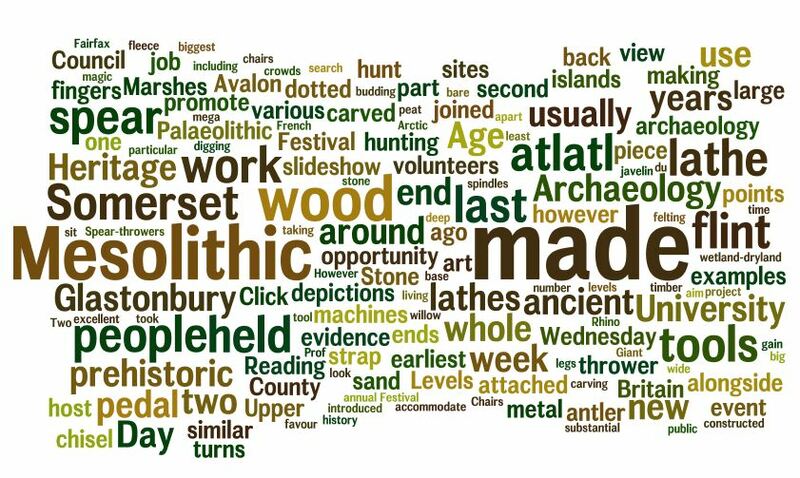 With the most important Iron Age settlement site down the road from us, we thought it apt to have a go at making the pottery familiar to the ladies and gents 2000 years ago, living at Glastonbury Lake Village. Glastonbury Ware is finely decorated, well-crafted, darkly coloured vessels providing a real contrast to the standard ‘digestive biscuit’ sherds more commonly associated with this point in time prior to those clever Romans who waltzed into Britain just after the turn of the millennium. The workshop was spread over a week at the beginning of February, with the first day focussing on how to go about making these beautiful vessels. Our guide for this part of the journey was local potter/ceramicist, Amiee Lawn. Glastonbury Ware pottery was made before the use of a potters wheel in Britain and thus involved coiling the clay and building up the vessel gradually with successive layers of ceramic sausages. Each coil is of a regular and even thickness, which is placed upon a solid base of clay; the joins are sealed by the use of a comb to scrape the layers inside and out together to create a solid bond. Escaping the weather in the RSPB classroom. The sides of the vessel is built up in coils. Some vessels ready for finishing. The forms of the pots are simple in design, most probably utilised for domestic cookery and storage, however some of the complex patterning suggests they were the top of the range stuff. The Le Creuset of the Iron Age world. After the shape of the vessel was completed, these designs were then added to our pots using tools readily available to those chaps living out in the marshes; swan’s feathers, blackthorn spikes and whittled willow sticks. Its definitely not as easy as it looks! Rob’s vessel prior to decoration. Some of the completed designs. Two beautifully finished, yet slightly more plain vessels. Once we were happy with the finish, the vessels were left to dry for a week. It would obviously be much more preferable to leave them twice, thrice or even four times this long to allow them to dry out more thoroughly, but time restraints dictated this. 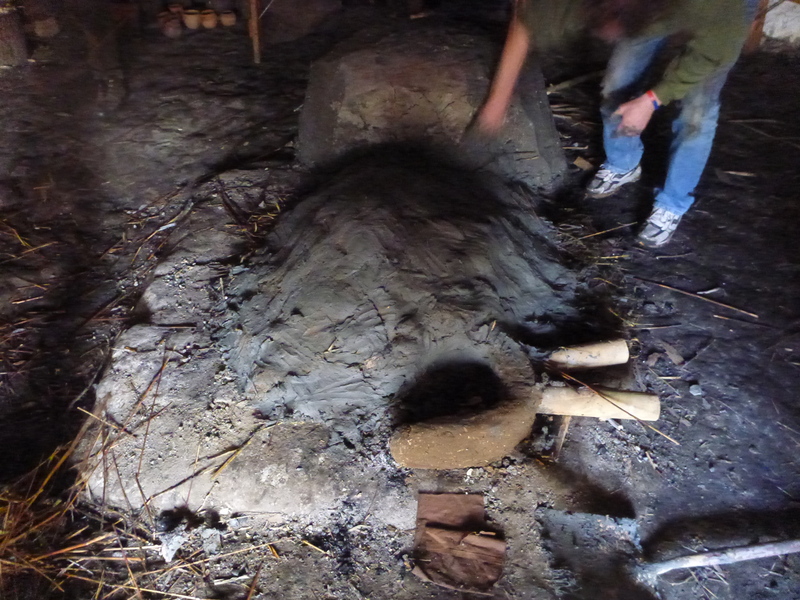 When we returned on the following weekend we could see we were going to need to encourage the moisture to leave the clay a bit more vigorously, so we lit a massive fire, placed the pots and ourselves round it and carefully persuaded the water to be driven out of the clay. The process was amazingly intimate as we bonded with the vessels- each crack and pop sending up a huge sigh of despair from the group. Burnishing (rubbing) parts of the vessel with pebbles to compact the clay . Burnishing makes the vessel more watertight and buffs up the surface. The pots sitting round the fire. Notice the oily sheen on some, an experiment into the effect of beeswax and other substances on the finish. The potters sitting round the fire. The first casualty of the drying process. Fortunately only a very few of our creations succumbed to a fiery death, most were ready for the true firing which was to occur the following day. Skip Greenwood joined Amiee Lawn as our tutors in this ancient art and led our little band of budding potters through the technology and technicalities of firing pots in a bonfire. The morning of the Sunday saw us warm the vessels up and gradually edge them into the blaze. Once we thought they were ready, we added more charcoal to cover the pots, then a huge stack of split dry timber and got the inferno going. This was left for about an hour, until we could see the pots starting to poke out- glowing almost translucently, bright red. This meant the clay had fired to ceramic. The next stage was an experiment to emulate the characteristic blackness of the Glastonbury vessels; we covered the blaze in damp reed and straw, then sealed the entire bonfire in clay. The idea was to exclude all the oxgen and thus create an deeply reducing atmosphere within the pyre, which should, in theory, turn the clay black. and…was the ‘blackening’ successful? You can’t leave us hanging. You’ll have to wait for the next installment to find out… It should be online tomorrow! So watch this space.